Survey shows dealers are concerned about the aging industry and price of boats. Short-term dealer sentiment dropped again in December to 55, and the 3- to 5-year outlook entered negative territory at 42. 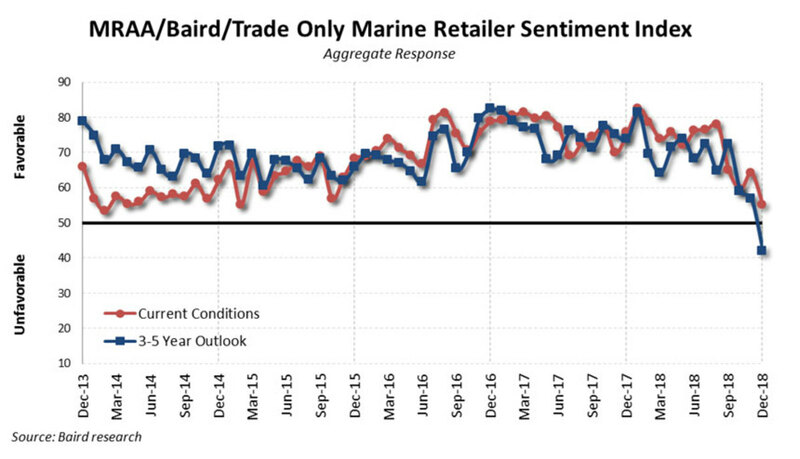 Marine retailers were less optimistic about current conditions than in November, with the index dropping from 64 to 55 in December. The reading was 76 in December 2018. The 3- to 5-year outlook plummeted to 42 in December from 57 in November and 74 in December of last year. Comments from dealers were politically charged, with several blaming the Trump administration for the drop in optimism and others blaming the recently-elected Democratic House. Another said families are limited by their Homeowners’ Associations, which do not allow boats and trailers to be stored outside, or homes without garages or garages too small to store vessels. Dealers also complained that manufacturers were either offering no promotions or promotions that weren’t big enough to move the needle.